What is the Fed’s Real Inflation Target? The Fed’s second failure is to treat the 2% figure as a ceiling rather than a target…[T]he Fed gives a range for projected inflation over the next three years with 2% as the upper extent. The Fed’s preferred inflation measure—core PCE inflation—remains below 2%…If the Fed does indeed have a symmetric approach to the target, as Mr Bernanke asserted yesterday, one would expect 2% to be at the middle of the range, not the top. In addition to my figure from the last post, the figures below further corroborate this observation. They show the central tendency ranges of inflation forecasts provided by members of the FOMC in the ‘projections’ material. Not every FOMC meeting has projection materials, but for every meeting that does provide them they are lined up chronologically in the figures. The final figure shows the inflation range forecast for two years ahead. 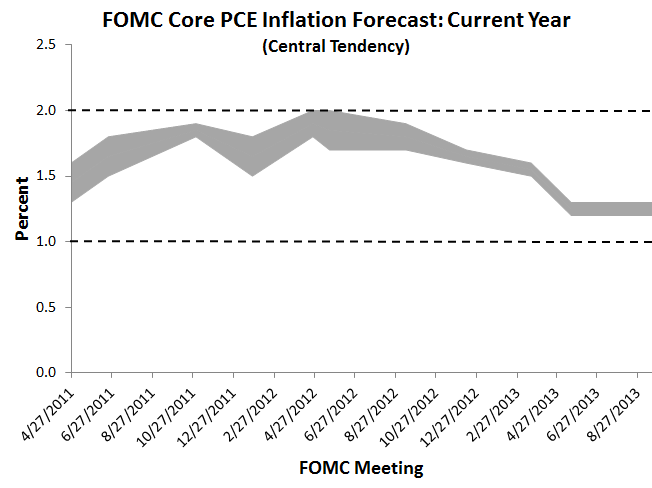 Except for the December, 2012 FOMC, it too shows an 2% upper bound on inflation forecasts. 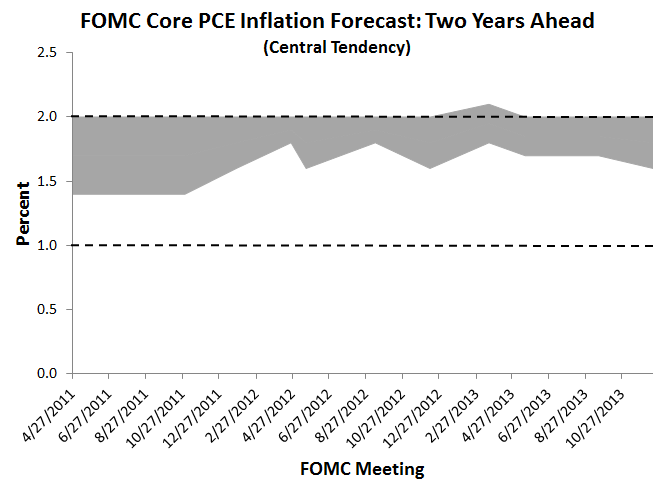 So even two years out the FOMC is predicting inflation no higher than 2%. Since the FOMC has some influence on inflation this far out, this forecast reflects beliefs about current and expected Fed policy. 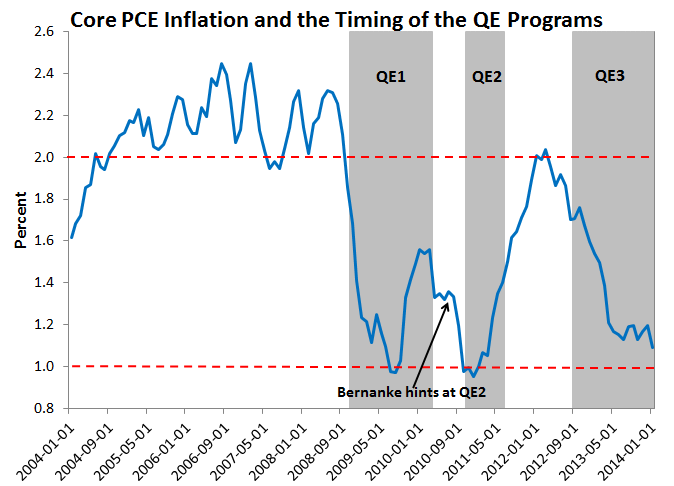 It suggests that the FOMC is not taking an symmetric approach to its 2% inflation target. 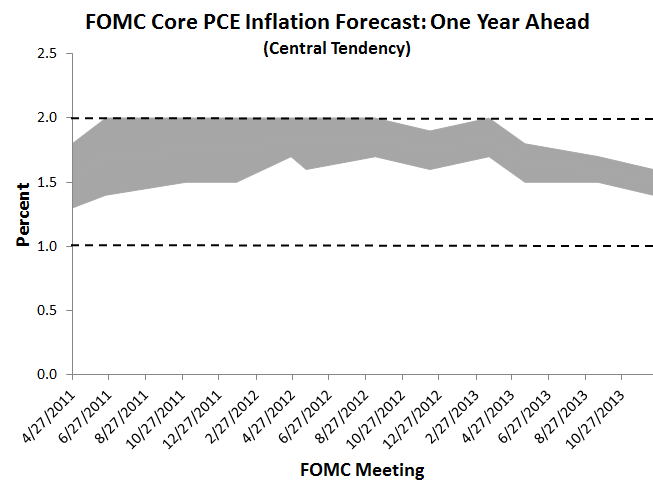 Instead, the FOMC is aiming to error on the side below 2%, at least in its forecasts. What is interesting is that the treasury market and the Survey of Professional Forecasters all have the average annual inflation rate over the next 10 years just above 2%. These are long-term forecasts so maybe they will all converge over time.